57 Days Park. Hipped roof with dormers; shutters are probably an addition. 57 Days Park. First story: brick; second story: wood shingles. 57 Days Park. Front vestibule oak door has original leaded glass. The door surround includes an entablature. 57 Days Park. The stained glass window above the living room stairway has a matching entablature. 57 Days Park. The stained glass window photographed in different light. 57 Days Park. Refinished oak newel post. 57 Days Park. The dining room French doors open into a sun room that seems to be an addition to the house. 25 Days Park. One of the two houses Thomas Day built with bricks from the family kiln in the early 1850s for his two sons. 33 Days Park. The second house Thomas Day built for his two sons. Originally the two houses were virtually identical except for the front entrance on either side of the house. 33 Days Park. Later modification: the attic story has living space inside the large, steep front gable. 33 Days Park. Oriel with supporting corbel. Allentown is a 36-block, half-mile-square residential and commercial neighborhood of Buffalo, NY, about a half-mile northwest of downtown. The entire neighborhood, with about 1,000 structures, is a local preservation district, one of seven in the city. The core of the neighborhood, including about 750 residential and commercial buildings, is listed on the National Register of Historic Places, making it one of the largest urban historic preservation districts in the United States. The narrow tree-lined residential streets are filled with 19th century homes of wood and/or brick construction that illustrate a number of architectural styles, including Italian Villa, Italianate, Second Empire, Queen Anne, Eastlake, Georgian, Colonial Revival, Federal, Renaissance Revival and Workman's Cottage. The history of Allentown begins with two villages, Buffalo and Black Rock. Founded before the birth of the nation, inexorably, the two villages stretched toward each other until they met at the western end of what is now known as Days Park. Lewis Falley Allen arrived in Buffalo in 1827 from Massachusetts, as an agent for the Western Ensurance Company. The "Ensurance" business must have been as profitable then as it is now, since Lewis Allen quickly began speculating in land. By the time of Lewis Allen's arrival, Buffalo was already in the grip of an industrial boom unprecedented in any other city in the country. Allen bought 29 acres of land from the extensive Holland Land Company holdings and built his home near Williamsville Road (now Main Street), where he also planted orchards and began to indulge an interest in breeding shorthorn cattle. Allen faced a serious problem. As his interest in cattle breeding grew, his modest 29-acre farm could not meet his needs for pasturing the herd. The problem was solved by driving his herd from the rear of his estate west for just over a quarter-mile, to a large untenanted pasturage ample enough for the new herd's grazing needs. It is commonly believed that the well-trod path became known as Allen Street. In 1832, when Buffalo was incorporated as a city, the wagon trail known as Old Guide Board Road (now North Street), which branched west from Williamsville Road, became the City's northernmost boundary, about a thousand feet from Lewis Allen's door. The swelling population of the city began looking northward for land that was at once close to the affairs of industry and far away from its noise and stench. Lewis Allen was sitting on a gold mine. Although Allen moved his cattle and orchards to Grand Island, he remained a potent force in the life of Buffalo (his nephew was Grover Cleveland). He was one of the founders of the Buffalo Historical Society and of Forest Lawn, and he promoted the planting of the elm trees which were once the hallmark of Buffalo's streetscape. Days Park is one of three residential parks in Buffalo, Johnson Park and Arlington Park being the other two. 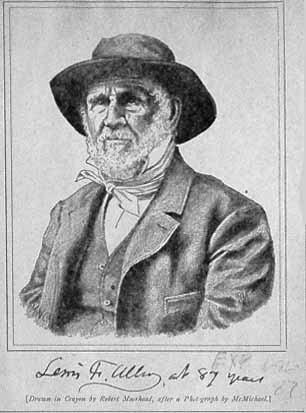 Thomas Day arrived in Buffalo in 1823 and made a small fortune operating the village's first brick kiln, and investing his profits in real estate ventures. He donated the greens-common which stretches from the western end of Allen Street to the northern end of Cottage, to the City of Buffalo as perpetual parkland in 1854. On the park he built the first two houses (Italianate-style) on 25-foot-wide lots (common for city side streets) for his sons. Both these houses, Nos. 25 and 33, were constructed of his own brick and still stand. Buffalo is the home to America's oldest coordinated system of public parks and parkways, designed by the renowned landscape architect Frederick Law Olmsted who believed that rural, picturesque landscape contrasted with and counteracted the confining and unhealthful conditions of the crowded urban environment. Frederick Law Olmsted began his work for Buffalo in 1868. Days Park was not one of his originally designed parks, but after the responsibility of the Board of Park Commissioners was expanded to encompass all public greens and squares in Buffalo in 1886, the Board sought designs for several new small grounds from Olmsted. In April 1887, he submitted plans, including plans for Day's Park. One feature of the plan was a fountain, the only one specified by him for a Buffalo site. Unfortunately, the original Day's Park fountain was removed in 1923. Day's Park was extensively restored in 1989 and 1990 as a result of the efforts of the neighboring residents through the Day's Park Block Club. The fountain, surrounded by a wrought iron fence in the same manner as the original, was restored as a centerpiece of the delightful little park. Unfortunately, thieves masquerading as city workers stole the fountain in 1995; it wasn't until 1999 that funds were finally made available to again replace it. Aside from small changes, Day's Park very much remains the way Olmsted had envisioned it. For a more detailed history and 1909 photos of the park, see Days Park. One of the owners of this house grew up on this very street. Her mother still lives just a few doors away. As a little girl, she would peek in the windows of this house, because she loved it so much. You can imagine her excitement when they were able to buy it. The owners have lived in this 2400+ square foot Italianate style home for over 33 years. This is the only house on Days Park that is both a brick and frame structure. In the early 60's, it was a rental house ($80.00 per month) and was quite run down when the owners bought it. The owners did the restorations themselves which included stripping and refinishing all of the beautiful oak woodwork and floors. They even installed the ceramic kitchen floor themselves and exposed the brick chimney which was covered by an inch of plaster. While stripping the wallpaper (about 10 layers), it was discovered that the stairs actually went up the adjacent wall and faced the doorway. Note the stained glass window on the stair's landing (see photos). Also, the leaded glass window on the door as you enter. Both of these are original. The radiator covers were custom built for the owners in Amish Country to match other woodwork. The storage shed in the yard was built by one of the owner's father about 25 years ago. The driveway once extended through the yard, but was removed and replaced with green space. The house was included in the 1997 Historic Allentown Tour of Homes. "A Field Guide to the Architecture and History of Allentown," by Louise McMillan, et. al., published in 1987 by the Allentown Association. Still available from the Association. "Buffalo's Brick Italianates: An Allentown Legacy," by Sonia R. Efron. 1994.